Blue Mystic is under only her second who has maintained her in in good shape. 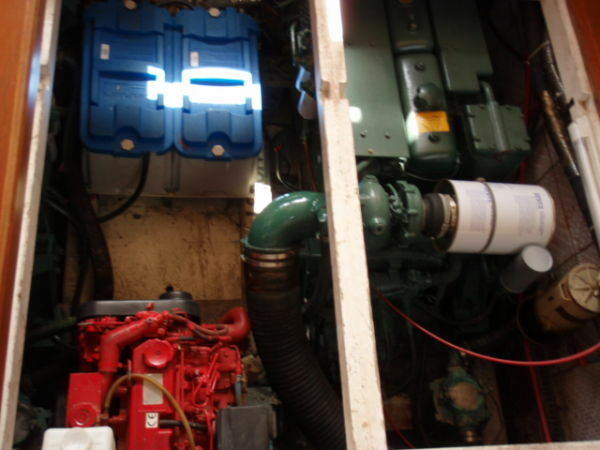 She spent much of her time in freshwater and has only 1015hrs on her 225 HP Volvo TAMD 60's. 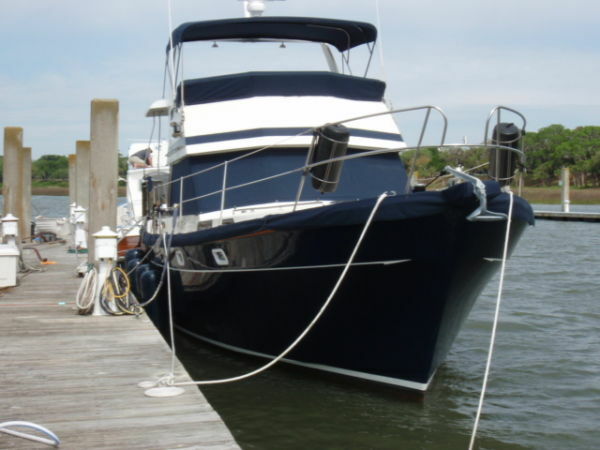 Her navy blue Awlgripped (painted in 2017) hull is in excellent condition, she has fiberglass decks with the exception of teak on the sundeck. The non-skid portion of her decks are light tan awlgrip and contrast nicely with the white gelcoat. Her interior has been well maintained with minor evidence of window leaks. 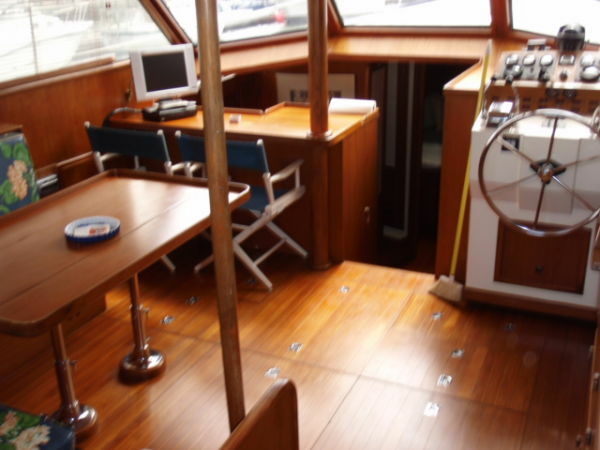 The cabin sole is teak and holly and all trim is oiled teak. Her fabrics have been tastefully updated and appear newer. She does have evidence of previous window leak which according to the owner have been repaired. Mamma cclo has an Island Queen forward w/ ensuite head and shower to port and ample hanging and drawer storage. 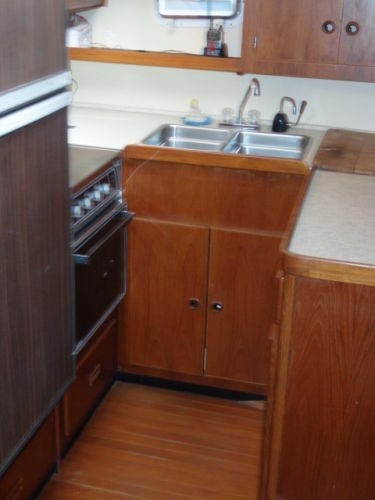 Next aft is the galley to port with Norcold refrigeraor three burner Princess stove with oven and microwave. Galley has ample drawer and cupboard storage. 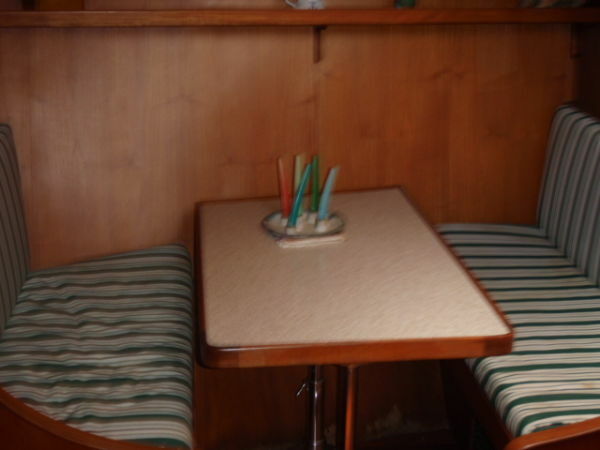 Opposite the galley is a convertible dinette that seats four comfortably. Up four steps to the bright and airy main salon which has a lower helm station forward to starboard and a breakfast bar opposite abve the galley. 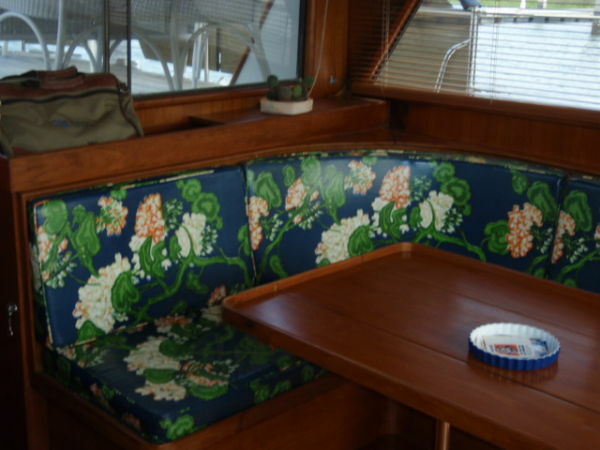 Aft of the breakfast bar is an L-shaped drop leaf dinette which converts to a double berth. 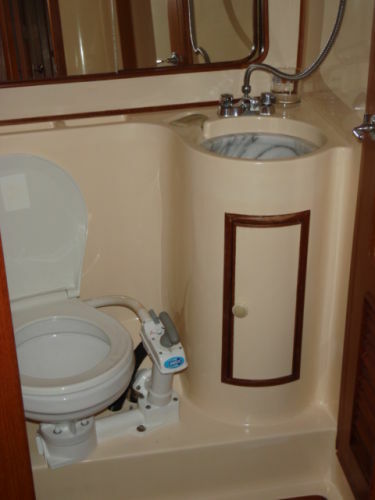 Down three steps to the aft cabin which has twin berths port and starboard, ensuite head with stall shower and ample drawer and cabinet storage. Three steps up from the main salon is the sundeck with a fiberglass weatherscreen and teak deck with white wicker table and chairs. Three steos up from the sundeck is the large flybridge which has l-shaped seating aft to port and a removable teak table. 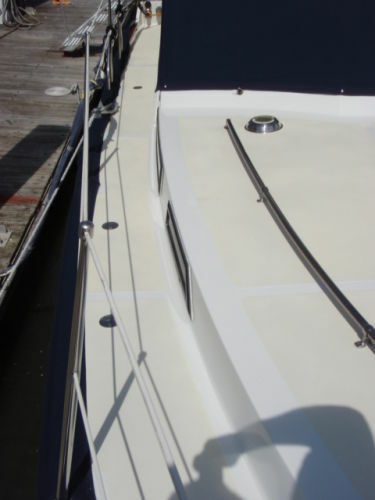 there is built in seating to starboard as well with vinyl chsions for all bridge seating. 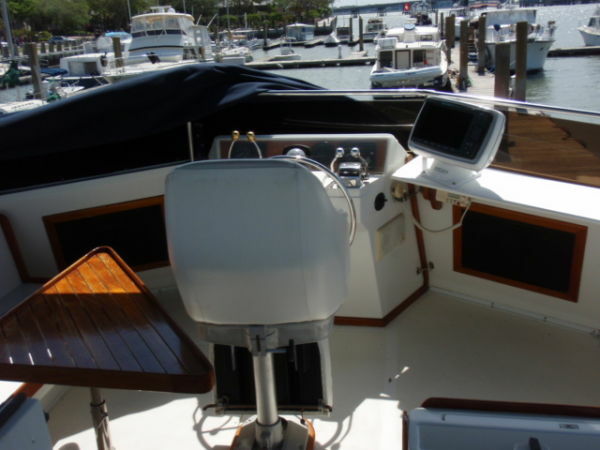 Flybridge helm is on centerline with adjustable pedestal helm seat (''06). There is a full sunbrella bridge cover. 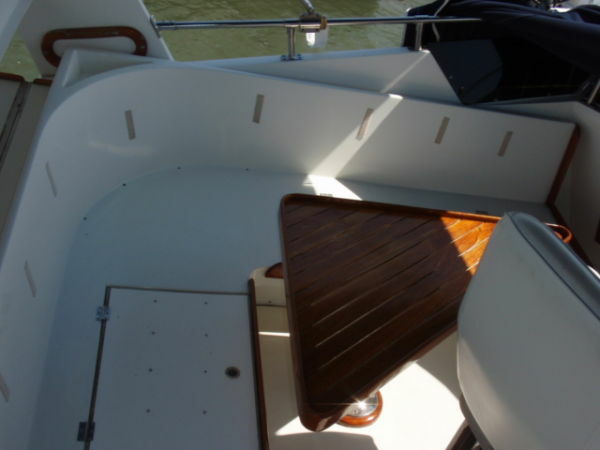 The exterior teak is limited to the cap rais and sundeck handrails which are all covered with sunbrella covers. 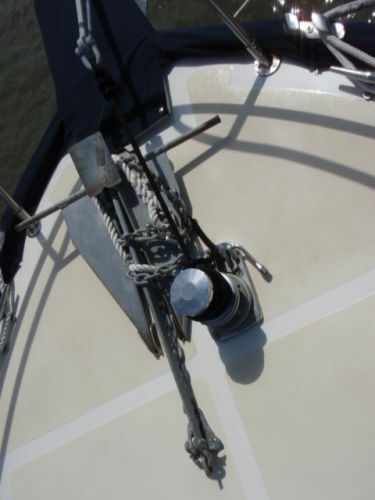 All the rest is stainless steel to minimize maintainance but allowing enough teak accent to make her yachty. She has a centerline gate in the sudeck rail with a stainless steel ladder down to the teak swim platform which has a ss swim ladder. 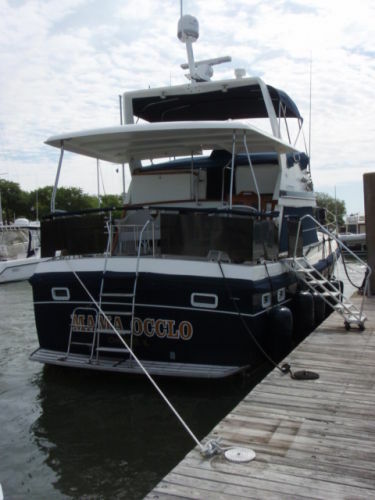 Mama Occlo is a one owner captain maintained 1984 President 41. 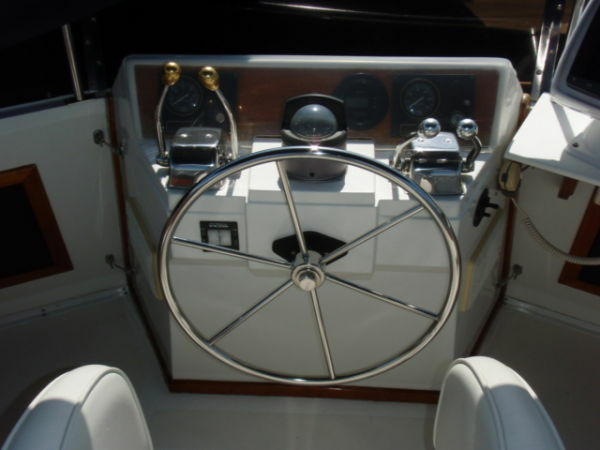 She spent much of her time in freshwater and has only 922 hrs on her 225 HP Volvo TAMD 60''s. 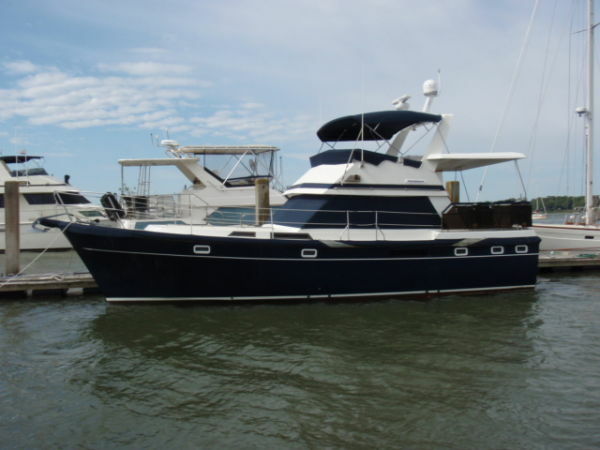 Her navy blue Awlgripped hull is in excellent condition, she has fiberglass decks with the exception of teak on the sundeck. 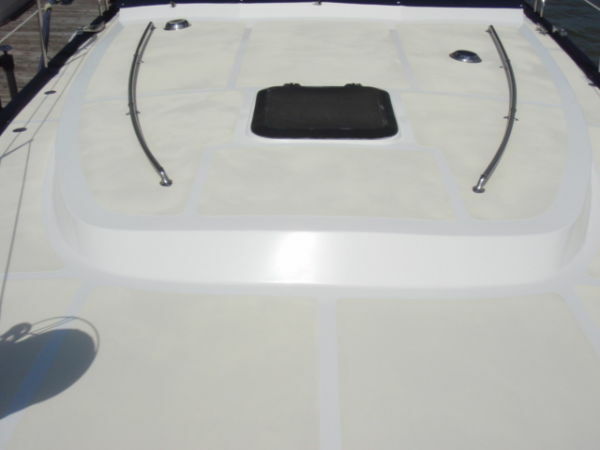 The non-skid portion of her decks are light tan awlgrip and contrast nicely with the white gelcoat. Her interior has been beautifully maintained with only minor evidence of window leaks. 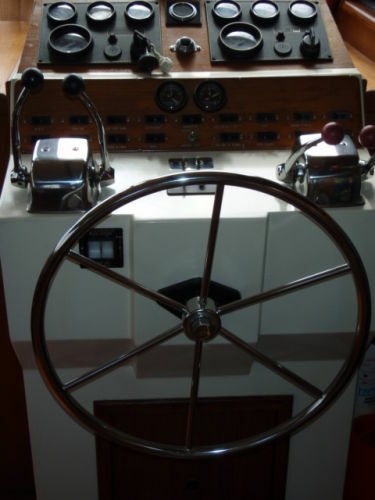 The cabin sole is teak and holly and all trim is oied teak. Her fabrics have been tastefully updated and appear new.